MINYA, Egypt, Feb. 2 (Xinhua) -- The Egyptian minister of antiquities announced on Saturday the discovery of three ancient tombs with more than 40 well-preserved mummies in Tuna el-Gebel necropolis of Minya Province south of the capital Cairo. "This is the first archeological discovery announced in 2019 after excavation work that started on Nov. 25 last year by a joint mission from the Ministry of Antiquities and the Research Centre for Archaeological Studies of Minya University," Khaled al-Anany said at a press conference in the archeological site. On the sidelines of the announcement, the minister told Xinhua that this is the third discovery announced in Minya. Two of the tombs are connected, which include the large number of mummies, while the third has a couple of limestone, pottery and wooden coffins. The event was attended by Secretary-General of the Supreme Council of Antiquities Mostafa Waziri, Egyptian Tourism Minister Rania al-Mashat, Minya Governor Qassem Hussein, professors from Minya University as well as diplomats from more than 10 foreign countries. 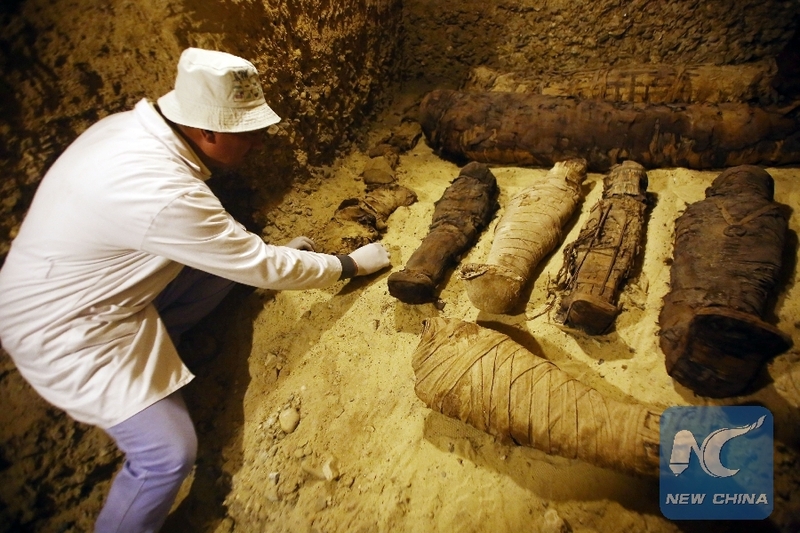 "We discovered three tombs with a shaft whose depth is about nine meters," Waziri told Xinhua. "We found more than 50 mummies, some of which have been moved to a nearby storehouse and here we have more than 40 mummies in perfect condition of preservation," he added. The tombs are about 2,000 years old, according to Ahmed Ata, a professor of archeology at Minya University and a member of the joint mission. "We found out the age of the tombs through the Greek letters written on the legs of the mummies," the professor told Xinhua, adding that about six mummies of dogs have also been discovered. The tombs are part of a familial grave that probably belonged to a family from the elite middle class. The Egyptian tourism minister said the attendance of foreign diplomats to witness the discovery is "a very important message" that the world is interested in and keen on visiting Egypt and seeing its archeological treasures. "Today's new discovery creates a lot of interest and curiosity of tourists about the Grand Egyptian Museum, which is expected to be opened in 2020," she added.